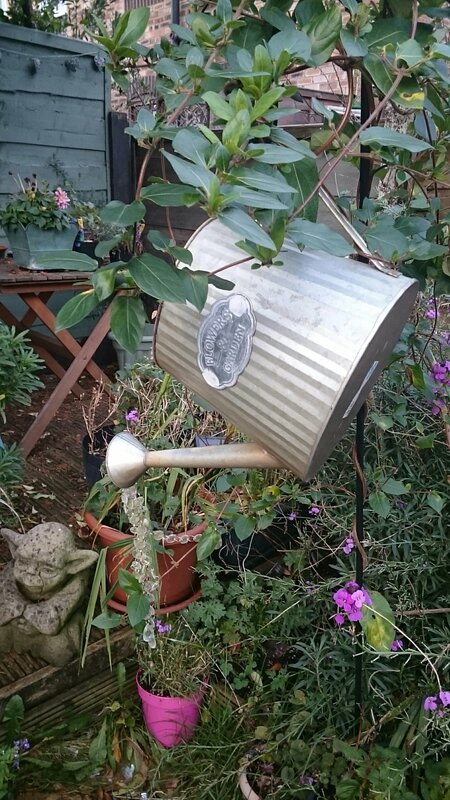 It’s never too late to spend time in the garden though, so I’ve been out tidying up, and pruning. I was at the bottom of the garden, and hidden behind a huge bush of purple perennial wallflower, I found some Spencer sweetpeas still flowering. I was gobsmacked, as the sweetpeas at the back door, and front door, were over about a month ago. Finding the sweetpeas reminded me that I’d not joined in with Cathy and her ‘In a Vase on Monday’ over on Rambling in the Garden for over six months. I need to rectify that! She’s got a Vase representing fireworks this week – it looks awesome. these are Spencer sweetpeas, they grow to over 6 foot, and I love the colour combinations, and of course, the smell. I buy them as small seedlings even though they’d be easy to grow from seed. We’ve only got small window sills and no room for a greenhouse – so needs must. I love their scent – it still manages to waft around our tiny house days after they’ve been picked. The lavender come from the newer plants we bought for our wedding, joining about 7 bushes dotted around our front garden. We’d planned to use them as centre pieces at our wedding but, due to a soggy September, most had gone over by our wedding day. All wasn’t lost though – lots of lavender confetti. The vase came from a local charity shop – a pound! It’s been a very difficult few years but I am so fortunate to have my Chap holding my hand (sometimes metaphorically), my family and friends all around the world, by my side. I know I need to take care of myself too. What I do know is Life isn’t a dress rehearsal. So on that note I plan more adventures in the across the North, the world, up a hill or two, buy the sea, drinking a Pimms, eating a cake or just chilling in the garden. I hope you’ll join us. 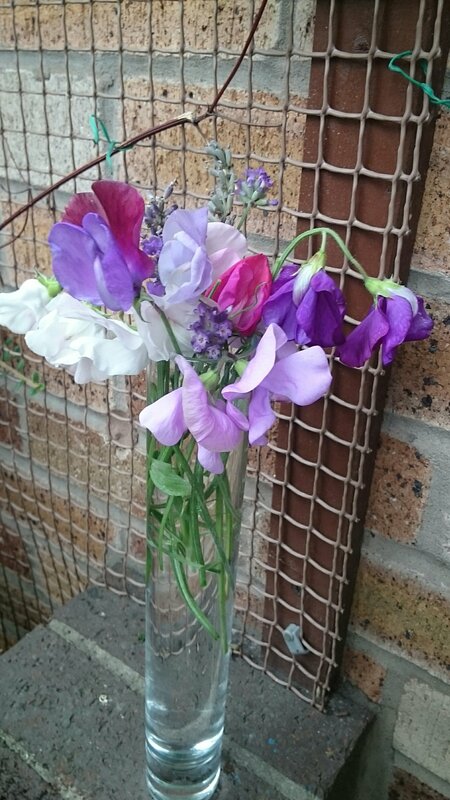 This entry was posted in In a vase on Monday, Life and tagged #365daysofselfcare, In a vase on Monday, Loss, love, sweetpea on November 13, 2017 by Bec - views from my garden bench. This has been a very strange summer for many reasons, the weather has been really wet, so many plants and flowers are weeks behind flowering when they should have. This week I dodged the monsoon downpours to pick these sweetpea flowers. They were tricky to photograph as the light was so poor – it felt like October. They smell wonderful though. This vase appeared before as part of ‘In a Vase on Monday’ before in late July 2015; it turns out I’d picked sweetpeas then too – completely different colours though. I do remember that the sweetpea plants were about 6 foot high and covered in flowers – they’ve barely reached 4 foot this year. As I mentioned, I’ve been very busy so although I’ve picked and photographed flowers and vases quite a few times this year – I haven’t ‘quite’ managed to write blog posts – chronically late even for me. As ever, I really enjoy seeing everyone’s flowers (and vases) from around the world – it’s really lifted me, inspired me and made me feel part of a community. Thank you everyone. ‘In a Vase on Monday’ is hosted by Cathy at www.ramblinginthegarden.wordpress.com so do have a look to see what people have created – this week there are some Ikebana Japanese flower arrangements – Cathy’s Ikebana Venus is beautiful. I think I might have to think hard about Ikebana and do some reading before I have a go. I still tend to plonk flowers in vases and hope for the best. It’s said that the poet John Keats (1795-1821) was the first person to use the name sweet pea for these flowers. Although. the style of sweetpeas he knew would be very different to modern day ones because of hybrids. In the language of flowers Sweetpeas meaning blissful pleasure. The big news is – My Chap asked me to marry him and I said YES!!! 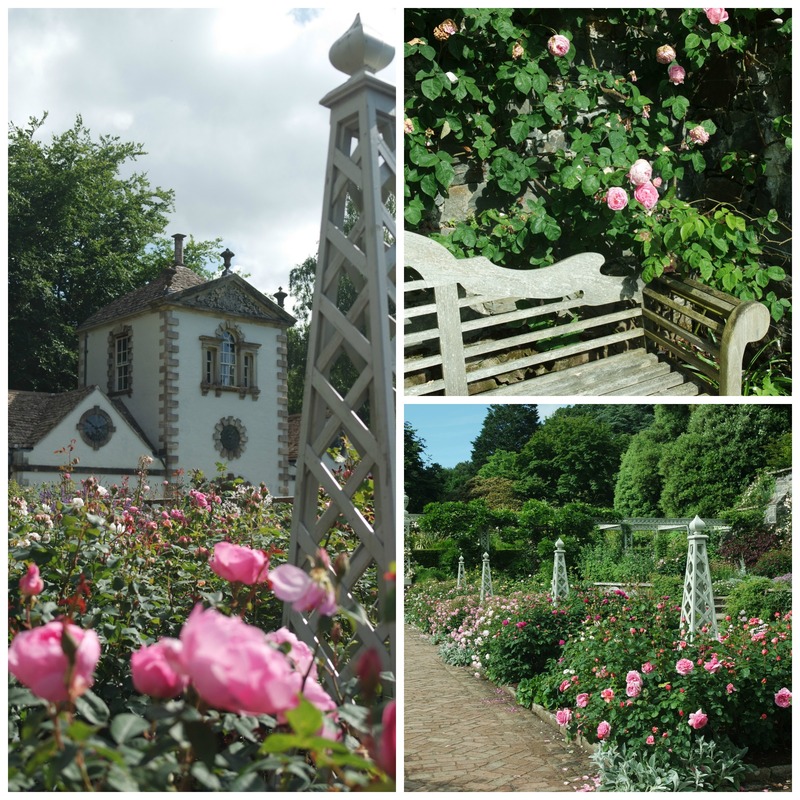 On Saturday 18th June 2016, we took a picnic and headed off to Bodnant Garden in Wales; we go often and love it there. We had a great time, wandering around the estate and the mountains of Snowdonia glistened in the sunshine. We took many photos of the Dell, in particular (the rhododendrons and azaleas were nearly over but the hydrangeas were just coming into bloom). We arrived at the rose garden about 5pm. It was exceptional – the roses are in full bloom and the scent incredible. 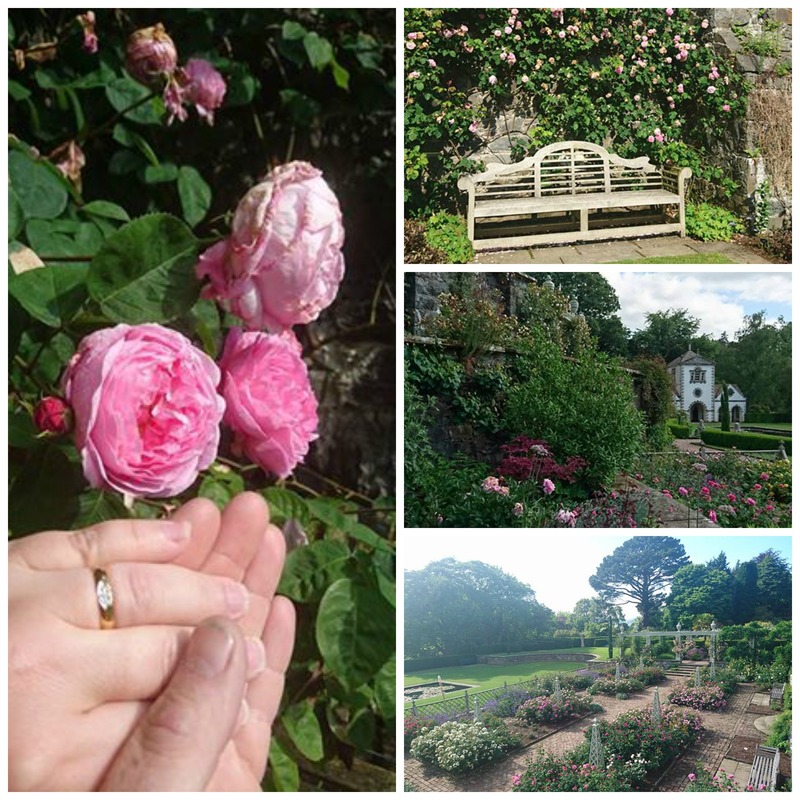 I sat on a bench by the roses My Chap got down on one knee and asked me….Blissful. My Chap chose my engagement ring too – it fits perfectly – what a wonderful man. We celebrated by buying a purple lupin from the Bodnant garden centre. My Brother and Sister in Law sent us a stunning Waterford crystal vase which will definitely be appearing as the star of ‘In a Vase in Monday’. I don’t think it will surprise ANY of my fellow gardening bloggers that the first thing we thought about was ‘what style and colours our wedding flowers should be?’ Roses will definitely appearing, as will lavender, and sweetpeas too. I hope we can grow some flowers for our wedding, so I’ll be seeking advice for a ‘cutting garden’ in our small, northern, north-facing back garden. Just need to get on with arrangements and find a venue – We are getting married late September 2017. This entry was posted in Gardening, Great gardens, In a vase on Monday, Uncategorized and tagged Bodnant, engagement, Ikebana, In a vase on Monday, rose, sweetpea on July 12, 2016 by Bec - views from my garden bench.